200 Hour Yoga Teacher Training Rishikesh India, This Yoga instructor training school has designed the 200-hour training course in accordance with the Yoga Alliance International. By the end of the course, you will be a certified Hatha Yoga instructor and will be certified and qualified to teach Hatha Yoga all around the world. You will be coached by the best trainers in Hatha Atri Yoga teacher training center in Rishikesh, India. This course has been specially designed to understand and experience Yoga in its full depth. Besides training you to be a yoga guru, this course will provide all the comprehensive knowledge about the proper asanas, pranayama, mudra, bandha, shatkarma. It will also provide you with the knowledge of anatomy, physiology, methodology, philosophy and much more. This course is not just a training program but will be a life-changing event. This teacher training course in Rishikesh, India will inspire you to communicate and share your knowledge with your partner and fellow knowledge seekers. This course will include intense yoga and-pranayama practice in which meditation, shaktkarma (yogic cleansing) will be performed twice a day. Along with this, adjustment philosophy anatomy and physiology will be conducted once, six days in a week. 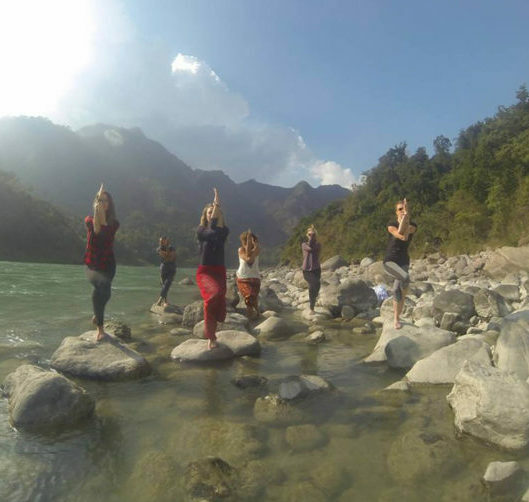 Details and description of the yoga teacher training course in Rishikesh are given below. Asana: The exercise practice is divided into two halves which are scheduled in morning and evening sessions. The morning session includes a couple of hour class of hatha yoga while the evening session includes another two-hour session of Ashtanga Vinyasa. To achieve perfection, unique belt props are used for adjusting the positions. If you have any queries regarding the adjustment, you may talk freely to your guru and they will help you with all their knowledge. Alignment: This session will enable you to learn about the correct positions of the asana. This session has been designed to help novice learners to understand the importance of the art of adjustment and alignment of asana. The alignment techniques class will be held every day for two hours and will focus strictly on making your asana alignment technically correct. Chanting: Yoga Teacher Trainees will be taught to chant and present ‘yogic’ mantras at start and the end of the yoga sessions for 30 mins, 3 days /week. Also, we will teach how to use the mantra to purify and balance the working of our body chakras. Pranayama: This is an important section of the Yoga training program. This session will enable you to understand the control of prana or the subtle energy that will help to control the mind. This session will be held twice a day after practicing asana. This session is a crucial part of this training program as it will help you to understand the power of pranayama and will help you in channelizing your energy in a positive manner. Mudra and Bandha: Mudra can be termed as an action that defines our feelings through our body posture. Practicing the art of mudra is concerned with sensory aspects. It requires great skill and technique in perfecting a mudra. A perfect mudra can help in achieving the best results out of the Pranayam, pratyahara,dharana, Dhyan, and Samadhi. The Bandhas are also included in mudras. Bandh is only 4 in number and forms an essential part of pranayama practice. Bandh without the pranayama is termed as a mudra. Meditation: Meditation is a very important aspect of learning yoga. Meditation allows you to go beyond the wilderness of ordinary mind and achieve peace. This session is held early morning for about 30 minutes, six days in a week. Philosophy: The yoga teacher training program in Rishikesh also includes philosophical sessions in the course of the week. These sessions are conducted by the Yogi Harishchandra or our Guest teacher Guru Buddhi Prakashji. They help the listeners to achieve peace of mind and ‘gyaan’ (knowledge) about the yoga and spirituality through their speech and knowledge. Anatomy/Physiology: The 200 hrs Teacher Training Program also involves sessions about learning Anatomy and physiology which are conducted by the Dr.Harsh. Shat karma: Shata means six and karma means action. The Shatkarma is the technique which involves six cleaning practices of the human body. The Shatkarma is practiced six days in a week during the early morning. You can save 11 USD when you confirm your seat 4 months prior to the course start date. If two people book together then the Early Bird Price is further reduced to 2300 USD for the pair. The Confirmation Fee is 200 USD. This is non-refundable but may be transferred to any other upcoming Yoga Teacher Training course. As an Institution we boundaries and criteria which are mapped with specific rules and regulations, all students are advised to follow our rules and regulations during the course! A student can pay in INR, Dollars, Euro or Ponds. The fee once paid will not be returned, although any circumstances happen, it would be possible to postpone for the next course. Every student must follow the dress rule strictly as instructed. Every student is requested to come to the class in yoga dress. Every question which is asked by the students in the class must be related to course only. The female students are requested to inform about their monthly period. And better to stop some poses like Shoulder stand, Head stand, Viparitakarani and Kapalbhati, Uddiyan bandha etc. How to Apply: Fill the application form and send it to rishiatri@gmail.com, after approval deposit $200 in advance to confirm your place in the course. We will send you mail after receiving your advance fee. Eligibility: Anyone who is interested in learning ancient Indian system of Yoga and its applied science? It is available for all, irrespective of caste and creed although your eligibility will be accessed after you send us detailed application form, after checking your eligibility, we will mail you and, you have to proceed for payment, after payment, your seat will be confirmed. Accreditations: The Yoga Diploma will be awarded by the Atri Yoga Center on successful completion. The course is also certified by Yoga Alliance for 200 hours,300hours and 500 hours Yoga Teacher Training and also internationally recognized by International Yoga federation the world topmost yoga organization in the world and can apply RYT. Course Syllabus: Yoga teacher training course 200 – hours is to understand and experience the yoga deeply with full attention but you don’t feel that you are a complete yoga teacher. This course will give you properly asana pranayama mantra, bandha, shatkarma, anatomy physiology methodology philosophy Alignment, and teaching experience. The course will inspire you to teach to the spiritual seekers. This course will give you an intense yoga asana pranayama practice twice a day and meditation shatkarma (yogic cleansing) art of adjustment philosophy anatomy and physiology once a day six day in a week. Yoga Styles: We have expertise in all kind of yoga styles to make the Yoga effective excellent and tremendous like Hatha Yoga, Ashtanga Vinyasa, Kundalini yoga, Raj yoga, Kriya yoga, Sivananda yoga and many more. Hatha yoga is a style which balances, body, mind and conscious to bring the state of super consciousness. It is smooth, stretching and holding type. Ashtanga Vinyasa is a dynamic flow of poses (asanas), it’s emphasizing ujjayi breathing, lock, gaze, and base for power yoga. The course also on different levels of asana, pranayama, shat kriya, bandha, mudras, mantra, and meditation. Hatha yoga, Ashtanga Vinayasa Flow, Yoga Guru, Testimonials, Picture Gallery, Latest Update,200 Hour Kundalini Yoga Teacher Training ,300 Hour Yoga Teacher Training., 500 Hour Yoga Teacher Training.